Easily visible from up to a mile away to make your dog safe and easy to find at night. Great for rural areas, camping, hiking, fishing, parks, outdoor events, jogging, walking or bicycling. The LED collar adjusts from 33cm to 48cm circumference neck measurement. Both the collar and leash have an easy on/off switch. Push the switch once for blinking, twice for steady light and three times to turn it off. 3 Volt lithium battery included. 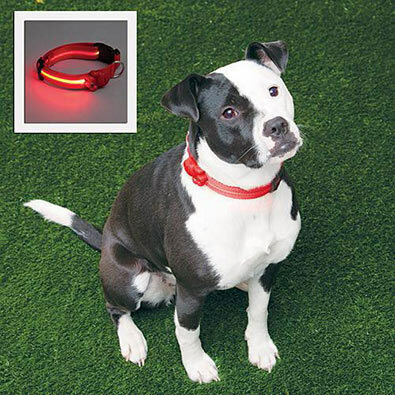 Our LED leash is easily visible from up to a mile away to make your dog safe and easy to find at night. Great for rural areas, camping, hiking, fishing, parks, outdoor events, jogging, walking or bicycling. Our 122cm durable, sturdy nylon leash has LEDs that are visible from both sides. The leash has an easy on/off switch. Push the switch once for blinking, twice for steady light and three times to turn it off. 3 Volt lithium battery included.